Did Instagram's rumored Snapchat rival pop up in Android banner ad? Did Instagram just punk us? Facebook-owned Instagram has been rumored to be working on a new photo messaging app to go head-to-head with popular rivals like Snapchat, and evidence supporting such hearsay may have just turned up in the most unlikely of places. The Verge today reported that Instagram appears to have mistakenly leaked the existence of a new Snapchat competitor called Bolt, which turned up as a new banner ad inside the current Instagram for Android app. 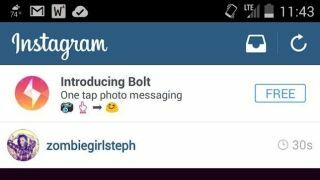 "Introducing Bolt," the screenshot snapped by Twitter user Richard Groves late Wednesday reads, promising "one tap photo messaging" and offering a link to download the free app via the Google Play Store. Needless to say, that particular button goes absolutely nowhere, and the mysterious banner ad vanished 15 minutes later, but not before other late-night internet users managed to spot the same message lurking in their own Instagram installations. This certainly wouldn't be the first time Facebook has tested unannounced features inside its mobile apps, with the recent iOS app Slingshot actually leaking onto the App Store before the social network had the chance to announce its existence. While it's easy to connect the dots and assume Bolt could be a Snapchat wannabe, a separate report from TechCrunch arrived at an entirely different conclusion, suggesting the app could be a fictional title instead. "It's worth pointing out that there's nothing in this leak that specifically confirms that Bolt is a forthcoming Instagram-owned property," remarked Sarah Perez, hypothesizing "Bolt" could simply be a placeholder for parent company Facebook's lucrative mobile app install ads. We've reached out to Instagram for further clarification one way or another, but in the meantime, Instagram lovers on Android should keep their eyes peeled for the elusive banner ad that kicked off all this speculation in the first place. Get your Instagram on with our review of the Nokia Lumia 635!